What does the AV32.1 come with? The speakers make a popping noise when I plug in my device. Is this normal? I connected my TV/receiver to the digital input but it's not working. What do I do? The speakers sound out of phase. What do I do? Can I add additional speakers to this setup? How do I connect all of the speakers to my device? Stereo RCA - commonly used to connect a phone or other device with an 1/8" (3.5mm) headphone output. For this, use the included 1/8" (3.5 mm) to stereo RCA cable. This input can also be used with older stereo equipment or devices with an RCA line-output. 1/4" Line inputs (2) - These inputs will accept a line-level signal from a 1/4" cable. This may commonly be used for mixers or audio interfaces. Optical input - This will accept an optical or digital input commonly found on some tvs or digital stereo receivers. This input will use a S/PDIF or Toslink cable. Before connecting your device though, you'll want to first make sure the speakers are properly connected to the sub using the speaker wire terminals and the provided interconnect cables. Match the red cables with the red terminals and the black cables with the black terminals. For a more detailed description, see the included User Manual or download it here. The speakers make a popping noise when plugging in my device. Is this normal? With any speaker system it's important to use a proper power on/off procedure. Generally, the speakers should be the last device turned on and the first to go off. All connections should be made while the speakers are turned off. For example, if the speakers are left on while turning on your attached TV or plugging in your ipod, this may create an unpleasant popping/electrical noise caused by the two devices making a connection. This is normal, but should be avoided. Over time this can have damaging effects on the speaker performance. So, just make sure that your devices are attached and turned on before powering on your speakers. It may also help to turn the volume down on your device or the speakers before powering them on. The sub will have a volume control on the rear of the unit and the volume level will be indicated by an LED light on the front of the sub. This will adjust the volume for both the sub and the included speakers. The gain knob can also be pushed in to bypass the subwoofer when necessary. All the same functions will also be accessible from the remote. Oftentimes, TVs with a digital audio output may default to a Dolby Digital 5.1 or other surround setting as this is a common use for a digital output. 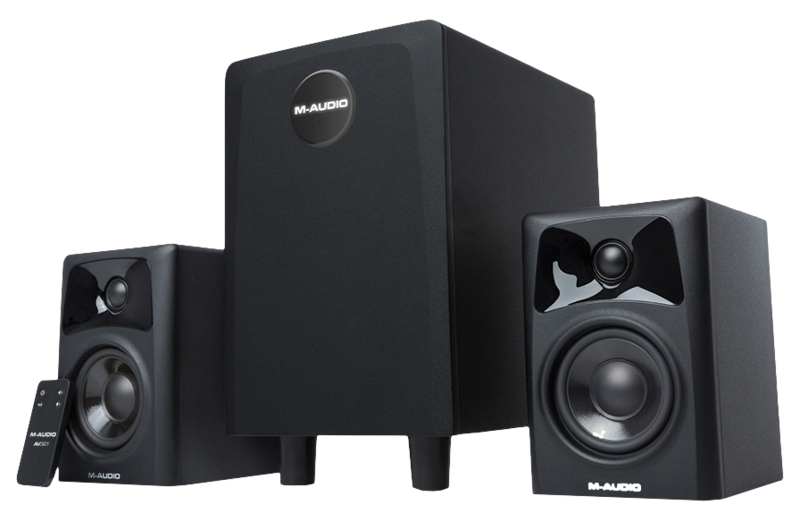 This 5.1 surround format will only support devices with those particular speaker setups and will not work with the AV 32.1. Instead, check your TV's manual or audio settings menu for a PCM or Stereo output. This configuration should line up properly with your AV 32.1 setup. Try to avoid placing the speakers directly against a wall. This can affect their low-end response. Keep the speakers equidistant from your listening position and equidistant from their surroundings. For example, if your left speaker is 6 inches away from your wall, your right speaker should also be 6 inches away from the wall. This will help the symmetry between the speakers. The speakers will inevitably resonate with low frequencies, so it may help to put these on speaker stands or acoustic isolation pads to keep your desk from vibrating sympathetically. This can help improve the bass response. As studio monitors, it's a good rule of thumb to place the speakers in the "first third" of the room. Ideally, this means measuring one-third of the distance into your room and placing the speakers on or before that line. When placing the sub, start by placing it on the floor between the two speakers and move it around from there until it sounds good. Always place the sub on the floor. When placed on items like speaker stands or desks, these can start vibrating sympathetically with the bass and start to affect the bass response of the sub. For further details and diagrams, download the User Manual here. The speakers sound out of phase. What should I do? Phase issues can come about if the sub or speakers are not aligned well enough in the room. This can sound like the low end or certain frequencies are being sucked out of the signal and can be a good indication that the sub has not been placed correctly in the room. The first thing to do here is to try moving the sub to a different position. If it still sounds off, try reversing one end of the interconnect cables to one of the speakers. Take the end of the interconnect cable at the sub and plug the black wire into the red port, and the red wire into the black port. Experiment with doing this with each speaker and even with both speakers to see what works best for you.